In today's 24 x 7 world, there is likely not a business on this planet, IBM® Smarter Planet® or not, that finds that their storage requirements are growing too fast and demand is starting to outpace supply. Not only this, but in this cost-conscious environment of today, the costs of managing this growth are likely to be eating into the IT budget. One way to make better use of existing storage without adding more complexity to the infrastructure is the IBM System Storage® SAN Volume Controller (SVC). For many years now this has helped business become more flexible, agile, and introduced an extremely efficient storage environment. SAN Volume Controller is designed to deliver the benefits of storage virtualization in environments from large enterprises to small businesses and midmarket companies. Virtualizing storage with SAN Volume Controller helps make new and existing storage more effective. SAN Volume Controller includes many functions that are traditionally deployed separately in disk systems. By including these in a virtualization system, SAN Volume Controller standardizes functions across virtualized storage for greater flexibility and potentially lower costs. Now, with IBM FlashSystem™ storage, SAN Volume Controller is enabled to extend its reach and benefit all virtualized storage. For example, IBM Easy Tier® optimizes use of flash storage. And IBM Real-time Compression™ enhances efficiency even further by enabling the storage of up to five times as much active primary data in the same physical disk space. 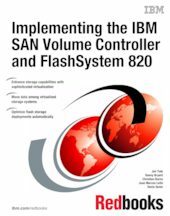 In this IBM Redbooks® publication, we show how to integrate the IBM FlashSystem 820 to provide storage to the SAN Volume Controller, and show how they are designed to operate seamlessly together, reducing management effort. In this book, which is aimed at pre- and post-sales support, storage administrators, and people that want to get an overview of this new and exciting technology, we show the steps required to implement the IBM FlashSystem 820 in an existing SAN Volume Controller environment. We also highlight some of the new features in SAN Volume Controller that increase performance.